Mostly variants in German of the corresponding English Grafton/HarperCollins issues. 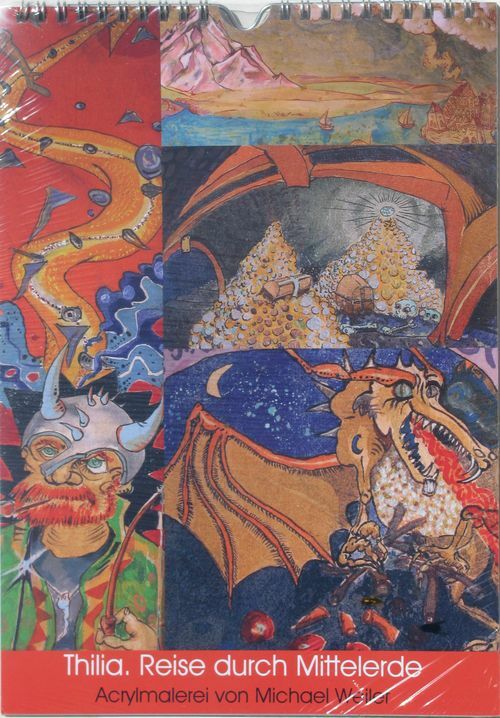 However, there are several interesting (including one of three Advent calendars in my collection) and rare issues, also. 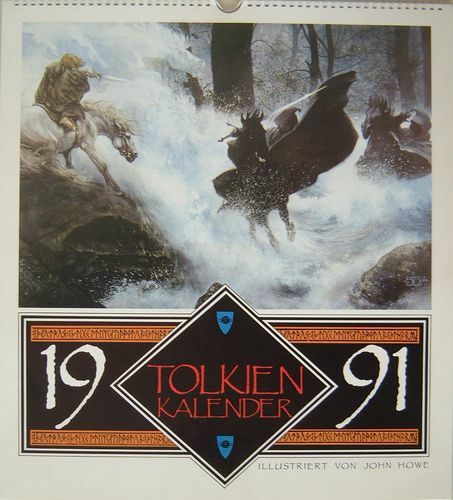 VARIANT: “1991 Tolkien Kalender” Illustrations by John Howe. Dimensions: 13.5 x 15 inches (w x h); wire bound; heavy wire hanging loop; medium-weight paperboard mailer/envelope printed with theme similar to cover illustration. 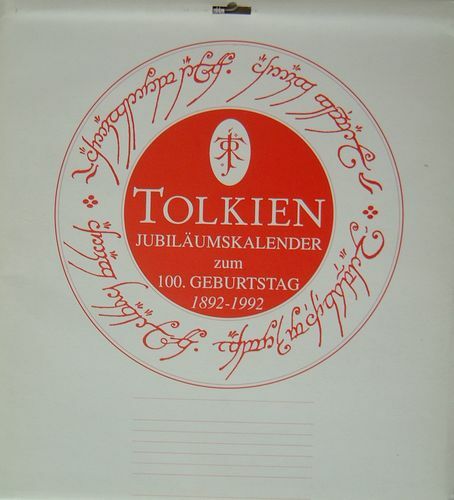 VARIANT: “Tolkien Jubiläumskalender zum 100. gerburstag 1892 - 1992” Centenary issue in German. 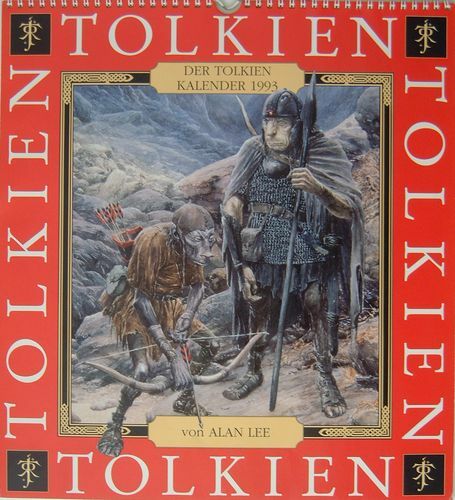 Illustrations by Ted Nasmith. 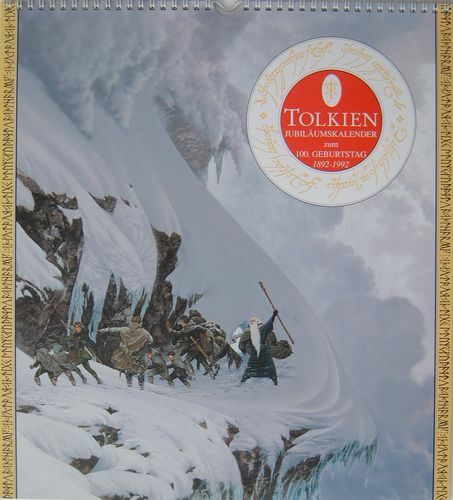 Cover: "The Anger of the Mountain". Dimensions: 13.5 x 15 inches (w x h); wire bound; heavy wire hanging loop; medium-weight paperboard mailer/envelope printed with the title. 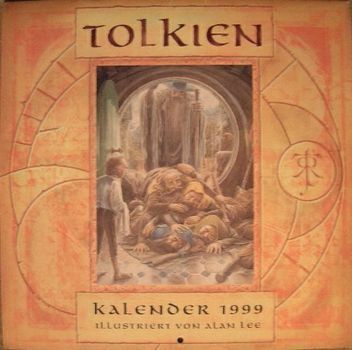 VARIANT: "Der Tolkien Kalender 1993 von Alan Lee" Illustrations by Alan Lee. 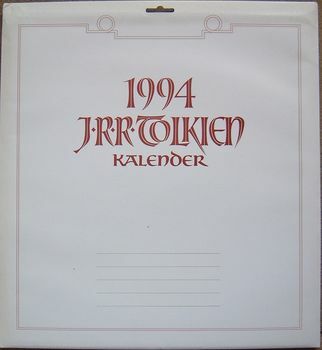 Dimensions: 13 5/8 x 15 inches (w x h); wire bound; heavy wire hanging loop; medium-weight paperboard mailer/envelope printed with “Tolkien Kalender 1993”. VARIANT: “J.R.R. 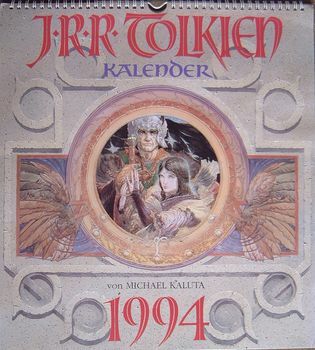 Tolkien Kalender von Michael Kaluta 1994” Illustrations by Michael Kaluta. Dimensions: 13 5/8 x 15 (w x h); wire bound, heavy wire hanger; mailer/envelope. "J.R.R. 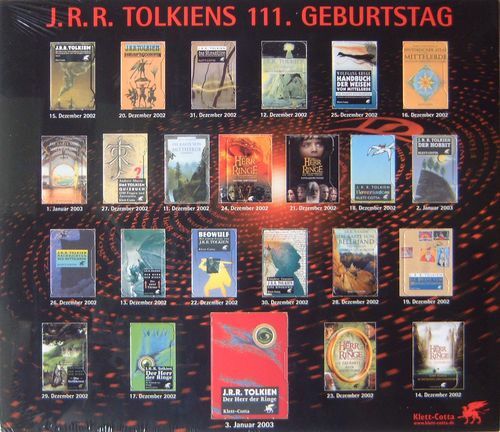 Tolkiens 111. 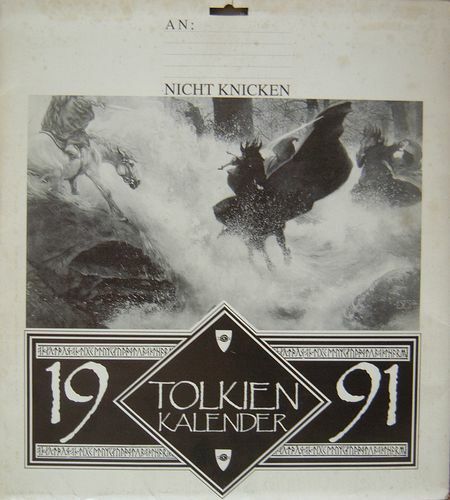 Geburstag" Advent calendar from Klett-Cotta Verlag, Stuttgart. 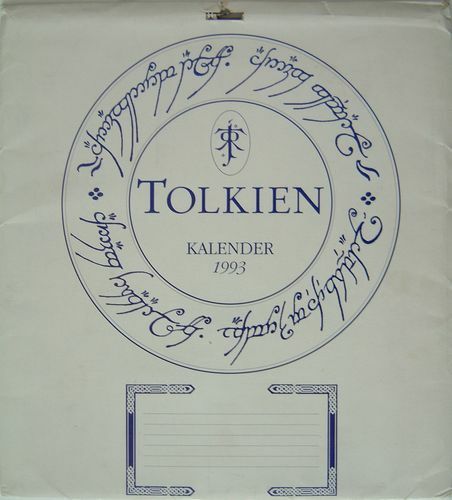 As an advent calendar (ending 3 January 2003), it has images of various Tolkien publications on 24 "windows" that can be opened to reveal a chocolate candy. To commemorate JRRT's eleventy-first birthday! 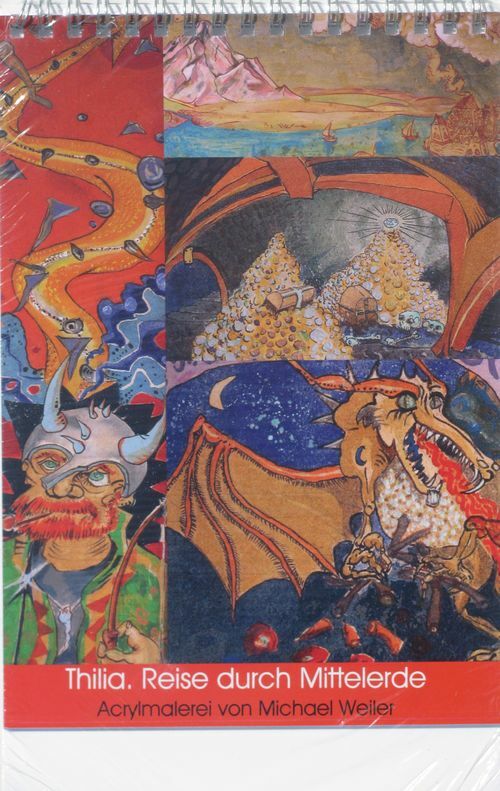 Dimensions: 11 1/4 x 9 3/4 (w x h); shrinkwrapped. 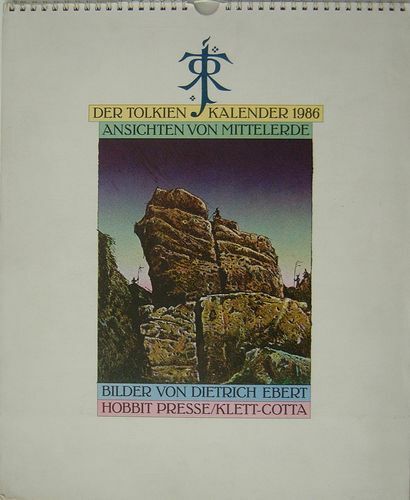 “Deutsche Tolkien Gesellschaft Kalender 06" German Tolkien Society. 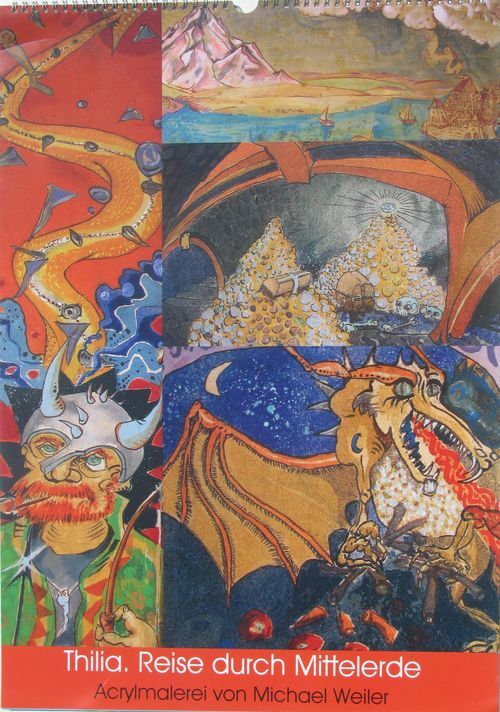 Illustration of Durin's Day (Durinstag) by Anke Eissmann. Cloth. Dimensions: 27.8 x 19.8 cm (w x h). 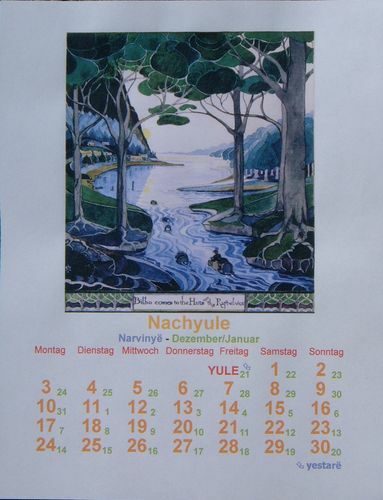 “Auenlandkalender" Shire calendar in .pdf format found at his website. Find it under "Specials". 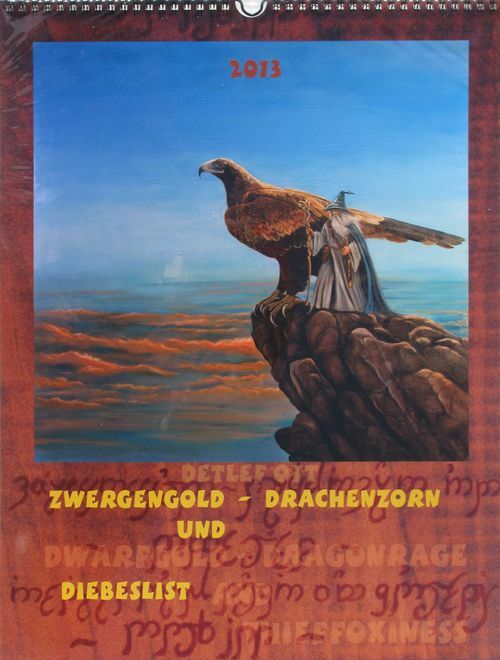 "2013 Detlef Ott Zwerengold - Drachenzorn und Deibeslist." 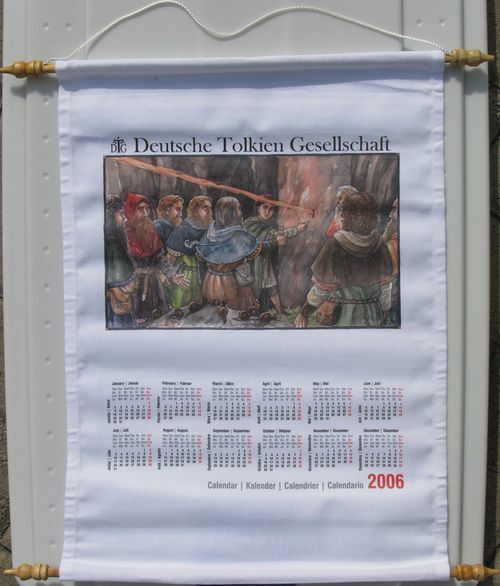 Calendar from Detlef Ott . Following is a letter from Hr. Ott about it. Dimension: 13 1/4 x 17 1/4 inches (w x h); black wire bound with wire hanger; shrinkwrapped.